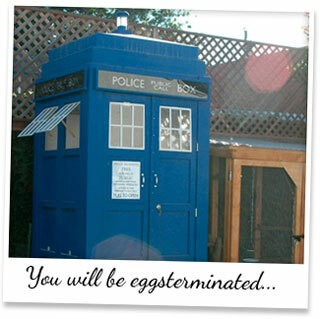 Eggsterminate, eggsterminate! With several Doctor Who fans at Omlet HQ, there was much disappointment over the end of another series. Luckily, one clever chicken keeper must have cottoned on to this and cheered us up no end with his cracking combination of two 21st Century favourites – Chicken Coops and Doctor Who. DaveNinja (we don’t know his real name) has built the coolest (if a little geeky) chicken house we’ve seen in some time – a Chicken Tardis! Built from scratch it is one very impressive work of art and we hear that the Cyberhen are happy in their home. Now from Doctor Who to Fowlty Towers – yes, we did spell it right. Chicken eggcentric Julie Smith has opened this new establishment in the village of Cowden, in Kent, and it is somewhat different to the famously chaotic hotel on the telly. For a start, Fowlty Towers is a hotel for poultry, not people. Secondly, the accomodation is far more stylish and modern than that on the sitcom, with Eglu Cubes for bedrooms. And finally, you can ensure all hens will be fed and watered well, without a barmy, Spanish waiter in sight. Owner Julie is passionate about chickens and she gives guests all the love, care and attention they deserve on their stay. The food is deleggtable and the bedding luxurious, so you’ll be happy to leave your hens there whilst going on your own travels. Visit the Fowlty Towers website to find out more and click here to watch a short video. Hip hip hooray, it’s World Egg Day! First celebrated in 1996, this is a day solely in honour of the humble egg. An affordable source of protein, eggs are a key-player in the diets of people around the world, and it is used in so many of our every day dishes. Not to mention how yummy they are! So let’s take a moment to think about eggs. Where would we be without them? What would we dip our soldiers into? How would we make meringues? What would we call our famous chicken coops? You see, eggs are awesome! So get boiling, frying, poaching, scrambling and whisking tonight, and make sure you have an eggstra special dinner. Happy Egg Day!